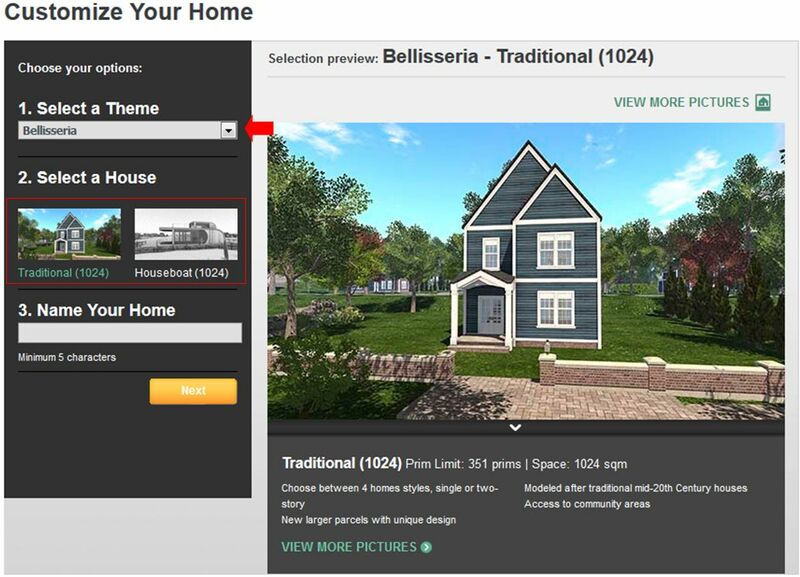 On Monday, April 15th, Linden Lab launched their new Linden Homes for Premium subscribers. These new Homes, each located on a 1024 sq metre parcel, are located in a dedicated new continent – which, as I revealed in my March preview, is called Bellisseria – situated between Sansara and Jeogeot. The continent itself – like the homes on offer – is a significant step up from the original Linden Homes and lands first introduced in 2010. Landscaped, and offering a degree of infrastructure: roads, rivers, paths, coastal regions with beaches, offshore-lighthouses, and so on. All of which offers an environment that is pleasing to the eye and make for a pleasant environment in which to live. For the initial release, two types of house are available: traditional suburban houses and houseboats, each of which comes in a total of four styles apiece. These four styles offer a varied set of looks that is enough to ensure neighbourhoods have a mix for looks. All come with a land impact of 351 LI, offering a lot of opportunity for furnishing. It’s important to note that the houses / houseboats are not 1024 sq m in size; this is the size of the parcel on which they sit: and all have been designed to provide a degree of garden / yard space or waterside moorings for boats. The roads within the continent are driveable (although houses are not supplied with a driveway to link to the roads), while the waters are navigable in many places and a channels links the continent with Joegeot and Sansara. Unlike the older Linden Homes, these have controls built-in via a panel on the interior walls close to the front door. So, no going to a website to change the decorative style, set the window shutters, etc., everything can be done directly from the control panel – including getting a pack of extra fixtures, should you want to use them, and a box of textures that can be used so that any additional elements – room dividers, walls, etc., – you might want to add can match with the overall décor. 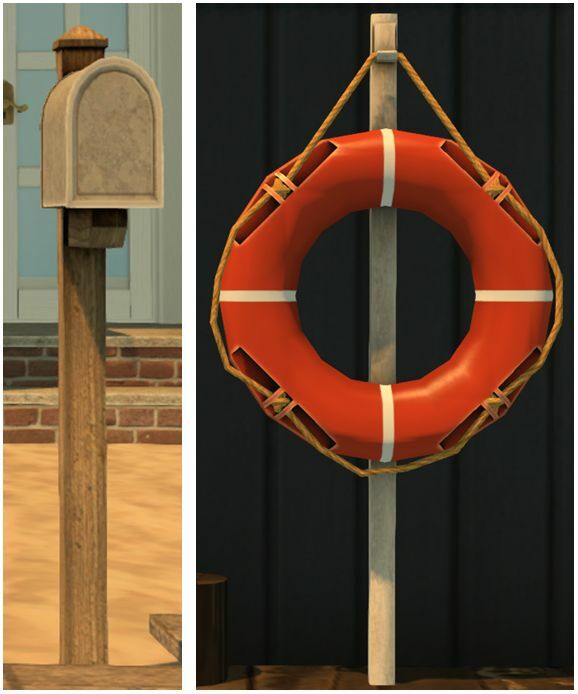 Individual style of house and houseboat are selected from the outside mailbox / life buoy. An interior control panel can be use for the window blinds, door control, etc. To say these new Linden Homes are a major step up from the originals isn’t really saying a lot; the old Linden Homes – as noted – are around 9 years old, and a lot has moved on in Second Life since then. However, the attempt to create a sense of community within the new continent is impressive and potentially goes some way towards reversing the “build and forget” approach to Linden Homes seen in the past – although how well it succeeds in terms of getting people not just to take the houses and engage within the develop to create local neighbourhoods / communities remains to be seen; and the matter really is up to those of us who take up the houses. For my part, I like the approach, and several of the designs. Yes, the use of rooms in some can make them feel a little cramped, and some of the houseboat designs might not strike the right of aesthetic note, but there is no escaping the fact these are properties with potential, and if you are a Premium subscriber, they may well be worth taking a look at, even if you already hold land. Note: for full details on the new Linden Homes – prerequisites for obtaining one, the application process, and so on, please refer to the Linden Homes wiki page. If you have not used your default allocation of free tier – (1024 sq m), then a new Linden Home is yours without any additional payment. Otherwise, the standard Premium tier rates apply. As with the original Linden Homes, the new homes are obtained through the Linden Homes registration page – which, at the time of writing still includes options for the existing Linden Homes, although these are to be gradually phased out. However, unlike the “old” homes, you only select with you want a house or a houseboat, not the actual style of the house / houseboat you prefer; these are selected in-world, via a mailbox for the houses or a life buoy for the houseboats. These controllers also let you change the style of your house / houseboat at any time, presenting another flexible option not available with the old Linden Homes. The selection process is straightforward, and you’ll be required to accept the Linden Lab Terms and Conditions prior to being able to receive the details of your new home. These are presented on the web page – just click the Go To Your Home button. (Unsurprisingly) I’ve already claimed my new Linden Home. Being an aviator and sailor, I went for a houseboat, selecting what I personally think is the roomiest of the options, the Windlass. Split-level it offers a good feeling of space, with a rooftop deck, and good opportunities for customisation. Sitting on one of the numerous sandbars surrounding the coast of the new continent, it opens out onto a nice community beach on one side, and presents plenty of mooring space on the other. My new Linden Home houseboat with one of my motorboats moored alongside. Note that the water in front of the houseboat is also part of the parcel, offering more mooring space, but the wooden piers are not part of the individual properties. Using a houseboat means I also have room for boats and planes on the water – particularly through the use of a rezzing system that allows me to select which vehicle I have rezzed (up to the land capacity, obviously). For those interested, I’ve previously covered this approach to having vehicles available without using up all your land capacity in Adding a little vehicle space with a rezzing system. Overall, a nicely done new environment. It will be interesting to see how things grow here – and how it might affect rentals among private estates for Premium members, given the overall attractiveness of this new continent. It’ll also be interesting to see how LL handle the retirement of the “old” Linden Homes, including any possible relocation among Premium subscribers who opt not to move voluntarily. The launch was accompanied by a new video from the Lab, which I’ve embedded below. I presume we will have to ‘give up’ our old home before we can move to the new district! As I understand the LH wiki page, if you don’t have the full 1024 sq m tier granted Premium members available, you can still own a new Linden Home, but you pay the standard tier rate for the amount of land you hold above the “free” allowance. So, you could own both. However, as the “old” Linden Homes are to go through a period of phasing-out (starting date TBA), quitting and moving at some point is liable to be the easiest option. I suspect LL won’t start shutting down the old Linden Home mini-continents until they start seeing a significant shift of people into the new continent. And some people might be tempted to wait until LL reveal what other types of home are going to be made available. Might there be some amidst a more rural setting, up among the hills, for example? I’m curious about being requested to ‘open Islandzviewer.exe….. I can’t go to my new Linden home, via Firestorm? How come? What’s ‘Islandzviewer.exe? Great post. I really think LL outdid themselves trying to create a desirable Linden Homes environment. Hopefully, the community will pick it up. BTW, unless I’m mistaken, you only need 512mts of available land in order to have one of the newer homes. Just like to old original ones. So there’s even more reason to move from the old linden homes to the newer ones. You basically get double the land and prims for the same cost (512m). Cheers! Currently, the 512 available requirement only applies to the older Linden Homes – which remain available at this time. As per the article and the wiki, you require 1024 sq m available “free” tier to avoid additional charges with one of the larger homes, otherwise you will incur the standard monthly Mainland tier rates. My husband got one of the house boats as a sort of “Man Cave” where he can get away and keep and use his float plane. He’s more into vehicles than I am. The only problem he had was when he hit the “go to my home” button then TPed it put him at the bottom of the water. I went to my new Linden home, by first going inworld (I use Firestorm) and then going to World / Land Parcels and there it showed my new Linden home; I clicked that, and tp’d from there, no glitches at alll, went straight to it. He just hit Pgup a couple of times and looked around when he broke water and he was there. In 24 hours the houseboat has run out. I have contacted the support and they have told me that they will do more as soon as possible. As per Zafia’s comment, more houseboats will be available “as soon as possible”.